Whilst you were enjoying a family event over the weekend, did you find your evening’s outdoors on the patio where cut short due to the late chill setting in? Why change the course of your plans just because the weather has made a slight adjustment. You can extend your alfresco lifestyle by adding a simple feature that will enhance the way you spend your time in your exterior living space. A fire pit table is a popular new trend that will give you a stylish contemporary look. When the cold sets in we are drawn to the natural warmth of a blazing fire, which is why this is an ideal solution and a great centre point for the family to gather and socialise. Building a fire may cause some concern when it is situated near your home, but there is nothing to worry about. A good quality fire pit table is designed to contain the fire within the pit area, making it very safe to use on your patio. With that being said, it is still vital to make sure you take all precautions when you are dealing with fire, fire is only as safe as the person handling it, so it must be treated with respect at all times. Traditionally people would dig a hole in the back garden and build a fire but tearing up the garden is not an ideal method and it also does not look too appealing either. 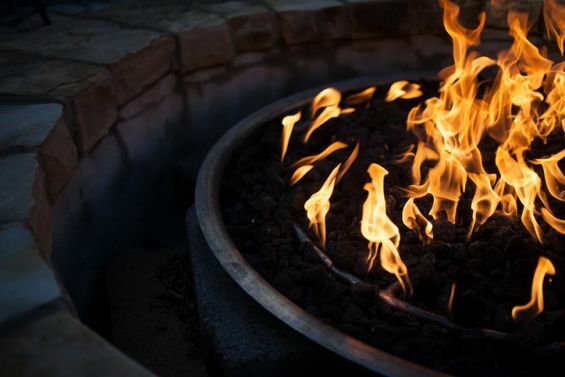 Modern fire pits come in all sorts of designs, from tables to cauldrons; there are a huge variety of designs out there on the market. These striking additions will allow you to move your fire around to suit your garden’s aesthetics, it will also allow you to take it on to a patio area and even under a louvered roof to create the ultimate alfresco experience. At Caribbean Blinds we have often had past clients combine our Outdoor Living Pods with fire pits to design themselves an open-air haven. Adding a fire pit will create that comforting atmosphere and our electronic, aluminium louvered roof systems will give you full cover from the elements and provide a relaxing ambient space. To ensure maximum warmth you can always add on infrared heaters to generate heat in the places the fire cannot reach. 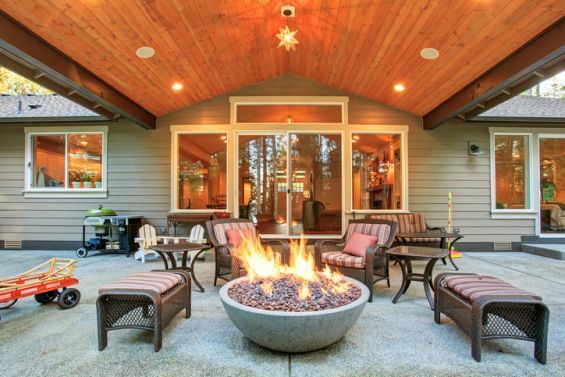 Together these two features will transform the way you use your outdoor living space.